Innovation takes place in networks of connected organisations, individuals, topics and technologies. Making sense of these interconnections and gaining relevant insights from them goes beyond traditional output-based analysis – it requires the use of a network lens when analysing innovation data. Kenedict enables clients to fully leverage a connected view on innovation and uncover valuable new insights based on this. 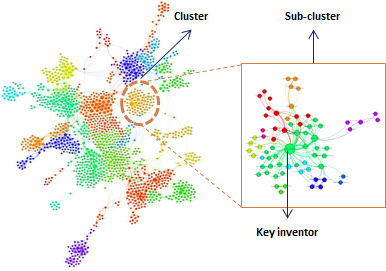 Internal knowledge networks of the own organisation, competitors, clients, suppliers and (potential) partners can be constructed based on various data sources, providing a unique and valuable view on inventor and technology connectivity. Mapping (the evolution of) networks in specific technologies and industries to identify key players, enhance market intelligence and improve technology forecasting. To gain insight into inter-company collaboration and innovation clusters, networks can be constructed for geographies (e.g. for Silicon Valley, or the Brainport area in the Netherlands) to gain an objective overview of regional innovative activity. Networks focusing on a specific individual (e.g. a prolific inventor in a certain industry) can be constructed to gain insight into the inventor’s reach and mobility, thereby providing a basis to predict future collaborative behavior. Each of these perspectives provide a solid basis for objective decision-making in various key areas in Research & Development. Please refer to the Applications section to learn more.